Visit Bude, Where Cornwall begins..
Visit Bude on the north Cornwall coast for a holiday that has something for everyone - from romantic retreats for couples, action filled family holidays, or a haven for the nature or geology enthusiast. Bude was once again voted the Best UK Coastal Resort in the British Travel Awards in 2018, making it can excellent choice for a holiday destination. Bude is large enough to provide a good range of facilities with a choice of accommodation, shops, restaurants and sports facilities, yet it is small enough to remain its Cornish charm. The nightlife is also quiet and relaxed. The area has a laid back charm that is traditional in a cherished way. There are many independently owned shops and restaurants for you to explore, with family run businesses creating a strong ethos in the town. There is something for everyone including a diverse range of indoor and outdoor activities - from sports centres, soft play areas and stately homes to fishing, cycling, golf, surfing and other water sports. Bude has plenty to suit all ages, interests or backgrounds. There are many beautiful sandy beaches to choose from with surfing hotspots, vintage style beach huts and dog friendly choices. 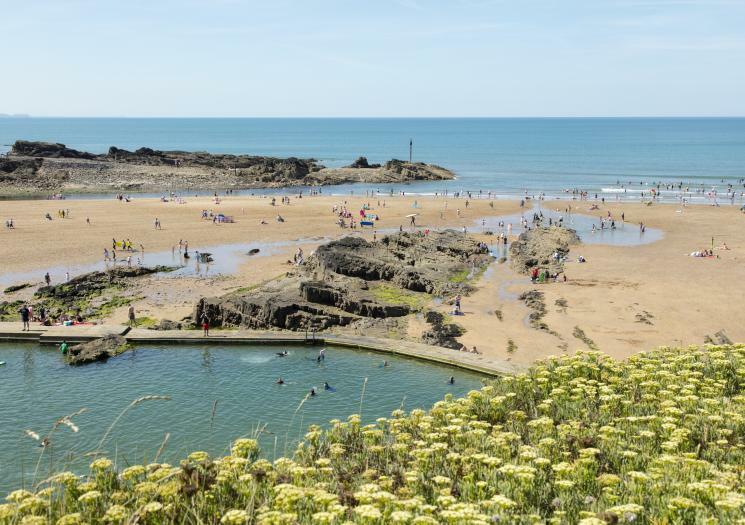 There are also spectacular views and unique natural attractions to be found - the Bude sea pool for example is cut into the rock at Summerleaze Beach providing a more relaxed dip or child friendly swim when the sea is rougher. There is also access to the South West Coast Path, which offers some excellent walking routes, whether you enjoy a short stroll to a stunning picnic spot or prefer a more challenging hike. Bude has some unique rock formations which can provide something of a spectacle while exploring the area - take a Geological tour or simply find Bude's unique rock formations for yourself. Have some fun at Bude Haven Recreation Park where you’ll find all manner of ball based activities. Pitch and putt, crazy golf, table tennis and squash courts. Perfect if the weather’s a bit dull. Discover Bude accommodation, beaches and things to do below!